Intermediate Children's Chorale Wins Gold! 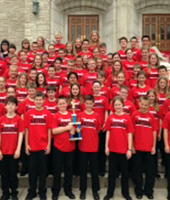 All Intermediate students are members of the Children’s Chorale, an award-winning choir of unchanged voices. Chorale meets 2-3 times per week and continues to build on the foundation established in our elementary music classes. Singers in Children’s Chorale develop good vocal technique, continue to build sight reading and ear training skills and routinely perform challenging literature. Children’s Chorale performs throughout the year in school concerts. They will often be asked to perform for Homecoming, Warrior Court, Grandparent’s Day and other special school events. Spring competition/music festivals round out the performance experience for Chorale singers. The choir has never received anything less than gold (highest rating possible) at any music festival/competition, an accomplishment they continue to strive to meet each year they compete. Beginning Band is open to all Sixth Grade Students. There is no experience needed. These beginners do indeed start at the very beginning and concentrate on basic fundamentals necessary to play an instrument. These include tone production, rhythm basics, posture, and terms and symbols. Performances include two school concerts as well as on the Grandparent’s Day Assembly.